Large, dense, slow-growing shrub of broad dome-shaped habit. Dull dark green leaves with a thin buff indumentum underneath. Compact trusses of pink flowers shading to white at the centres, with a few crimson spots inside. 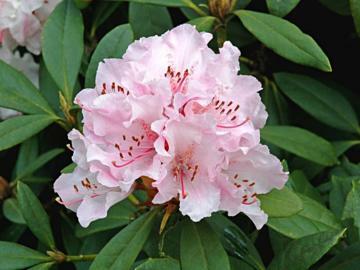 Very early flowering from January to March, or even earlier in a sheltered position. Valuable for its very early flowering. Raised by William Smith, Norbiton Common, Surrey, UK, 1829. Hybrid of Rh. arboreum x Rh. caucasicum.